On Friday night after watching the most epic Washington Husky game I went to put the kids to bed. In Pia’s room there is a piece of art on the wall with a very large, heavy Lucite frame on it. It has never been an issue at all. But I had a freak accident. I bent down to turn on the white noise machine that she sleeps with and I guess I straightened up with an unprecedented amount of gusto because I nailed my own head on the corner of this frame and knocked myself out. Concussion City. But I didn’t actually go to the ER until Saturday afternoon because I had a speaking opportunity on Saturday. I was the keynote speaker for a big Theta luncheon in Seattle that supported CASA, a near and dear cause. It is the most wonderful group of women and there was no way that I wasn’t going to show up – I am so glad that I did. But then in total contrast, I spend my Saturday evening in a packed ER (which is always SO fun, right?) So in the end the good news is that I didn’t fracture my skull and I don’t have bleeding of the brain (omg!!) but I do have swelling. So I am supposed to lay low for a few days and “rest my mind” for a few weeks. Is that funny? How does one go about resting their mind?! I get to take lots of naps without feeling guilty, and I have slept 10 hours each of the last two nights, which is unheard of! I am sure I will be better every day and hope to be driving in a few days. SO WEIRD!!! Right? Super bizarre. Only I could do this to myself. But back to good holiday stuff, like cookies!! 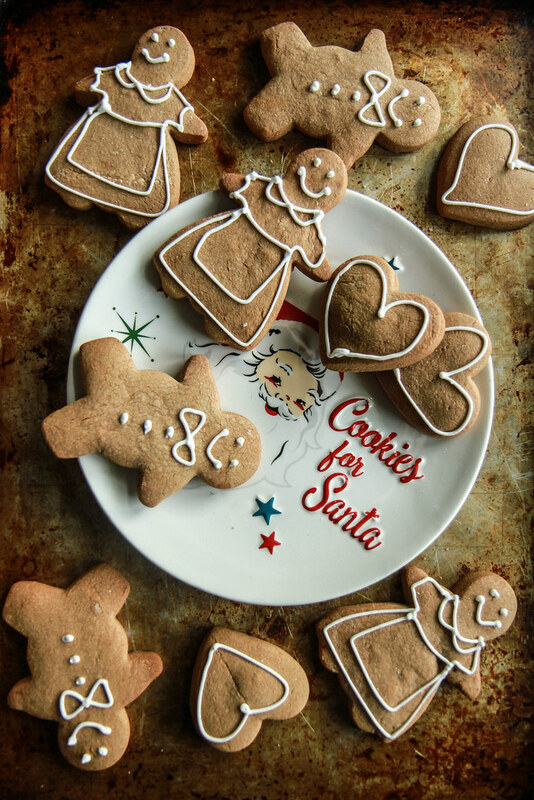 Specifically these Gingerbread Cookies which also happen to be Gluten Free and Vegan! Much like the Sugar Cookies I posted on Friday, these are so easy to make, great to roll out and cut and delicious to eat! And nothing says Holidays like Gingerbread men! Be sure to use this Vegan Royal Icing to decorate the cookies! And I changed my Facebook Live cookie baking and decorating class from this Sunday morning to Tuesday afternoon- I hope you will be able to join me! Tuesday the 6th at 3pm PT. In the bowl of a standing mixer combine all of the dry ingredients. Add the room temperature vegan butter in chunks and mix until you have a dry crumbly dough. Add the molasses and the coconut milk and beat until the dough comes together. It will be uniform but sticky. Transfer all of the dough to a sheet of wax paper and use the paper to form the dough into a disc. Refrigerate the dough in the wax paper for 1 hour. Preheat the oven to 350 degrees. Prepare two sheet-pans with parchment or silpats. Dust a work surface with powdered sugar and then roll out the dough with a little more and a rolling pin. You want the dough to be a bout ⅛ inch thick. Use cookie cutters to cut the shapes and transfer them to the prepared sheet pans. The dough will spread slightly so leave the cookies a little room on the pans. If you want to add sprinkles to the cookies, do this now- otherwise you can ice them when they are baked and cooled. Bake the cookies until they are turning golden around the edges, 10-12 minutes. Let the cookies cool for at least 10-15 minutes before transferring them with a spatula to a cooling rack. When they are completely cool, ice them with Vegan Royal Icing. Store the cookies in an airtight container at room temperature or in the freezer. “So I am supposed to lay low for a few days and “rest my mind” for a few weeks. Is that funny? How does one go about resting their mind? !” I think the doctor is trying to tell you not to make any major decisions for the rest of the month. Like, don’t put you house on the market, don’t invest a lot of money in a profit making scheme and don’t decide to repaint all the rooms in your home before Christmas. Do spend lots of quiet time with Pia, enjoy your husband going to the grocery store for the one hundredth time today. Watch the weather from your cozy couch. Re-read the Christmas story and remember what and why we are thankful at this time of the year. YES Jeannette!!! best advice ever! I’m so glad your injury wasn’t more serious! Last week I bonked my head HARD with the driver’s seat while trying to adjust it. After the pain started to subside, I was immediately like, really, is THIS how I’m going to go?! I guess it IS very *me. * These cookies are adorable and look delicious, by the way! 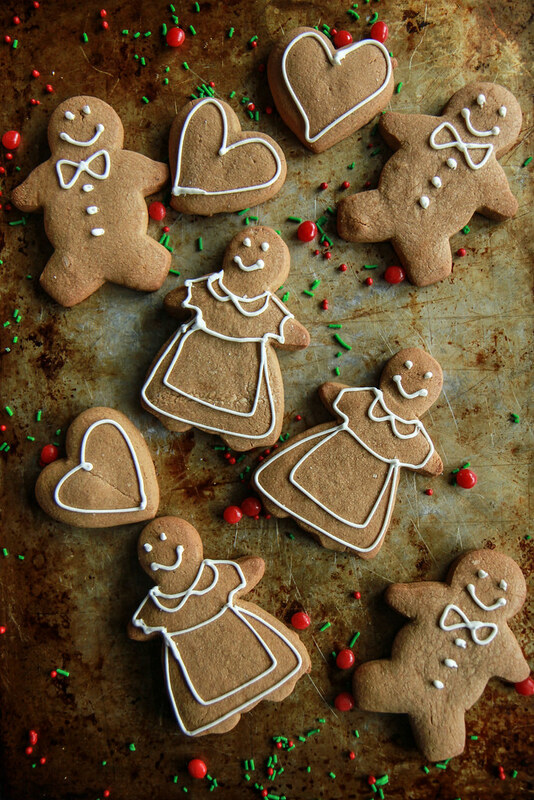 Those gingerbread cookies look so goog! Oh my goodness, Heather! So glad you are ok – what a freak accident! At least you have cookies to nibble on while you rest your mind :). 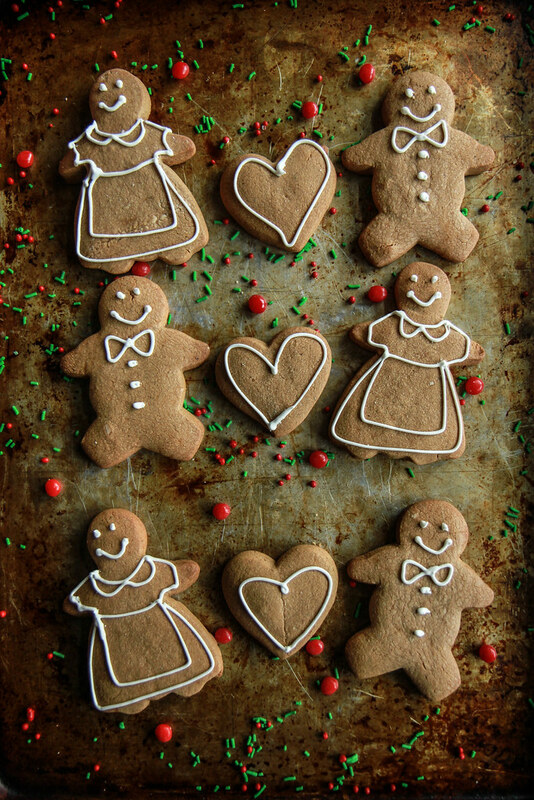 These are the cutest gingerbread ever! These are so adorable! It’s been so long since I’ve made gingerbread people! OH MY GOSH! So sorry to hear about the unfortunate accident. It may be a message to ‘slow down’ a bit. Please let us know how your progress comes along. Thank you so much Nechama- I expect it is probably a serious sign to do just that! Oh my goodness I love these Heather! So adorable!